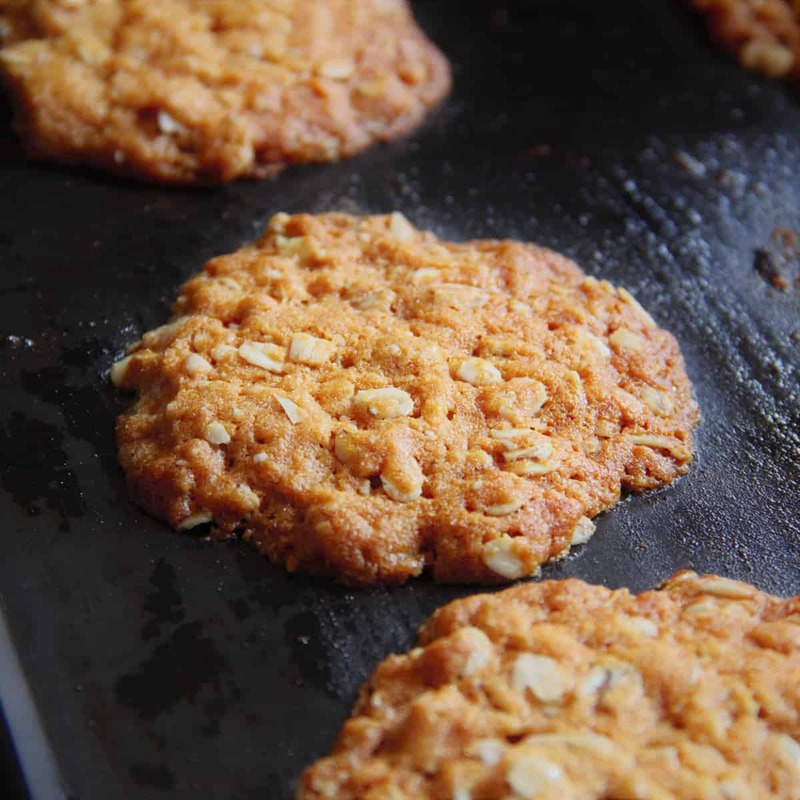 ANZAC stands for Australian New Zealand Army Corps, and these oat based biscuits have a history going back to the First World War and the ANZAC troops. 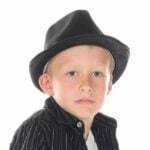 Now they have become a significant element of the annual ANZAC Day celebrations. 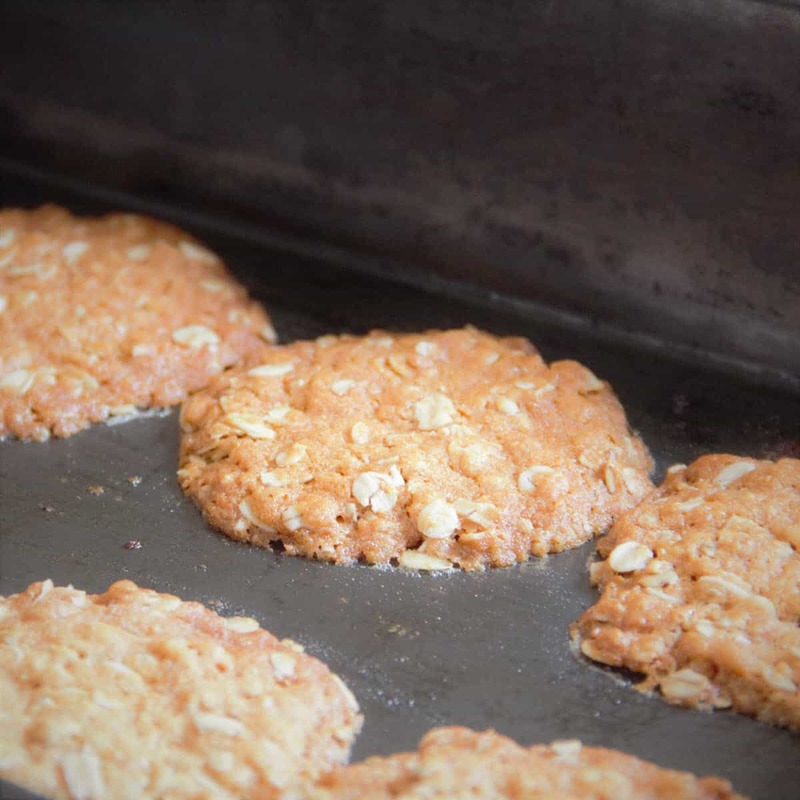 The biscuit themselves are traditionally very dry and don’t use eggs making them good to potentially send in care packages to deployed troops without spoiling, same reason they are an ideal biscuit to take outdoors today. Although the history is a little foggy, the main purpose of these biscuits appears to however be as a common item sold at fundraisers for the war effort. 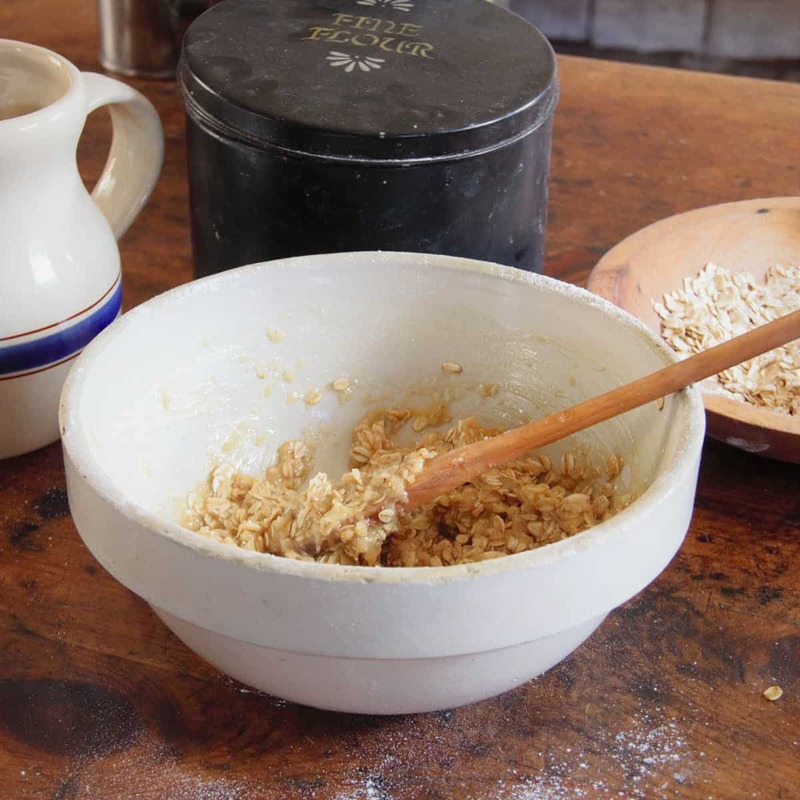 Additions of coconut, and/or nuts, as well as the softer chewier modern versions are all ones that appear later in history. 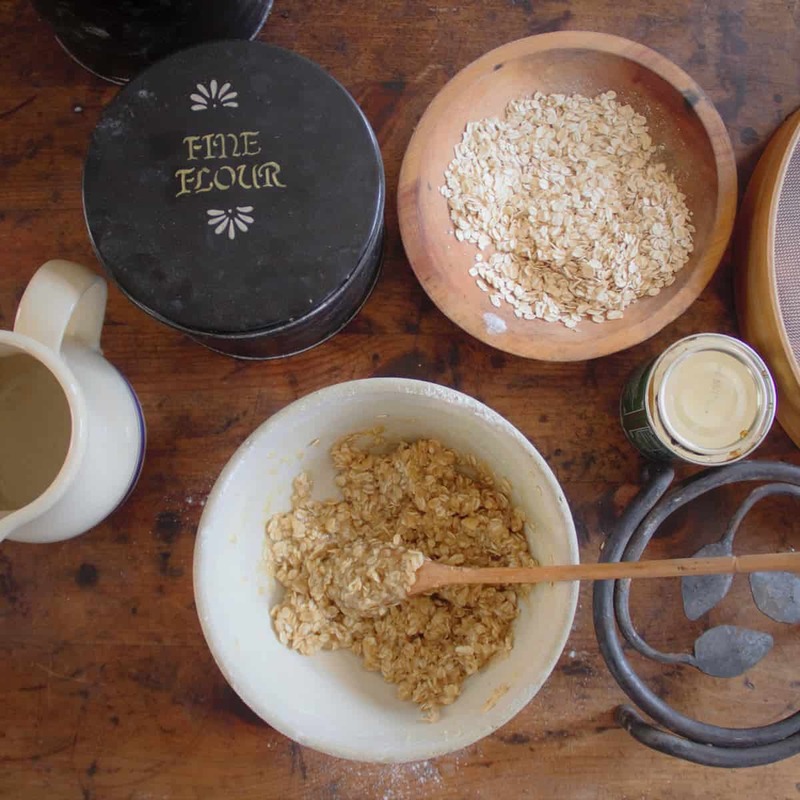 In a bowl combine the dry ingredients, the flour, oats and sugar. In a small saucepan or heat proof cup, gently heat the butter and golden syrup until the butter has fully melted. Combine the bicarbonate soda and hot water, stir then mix into the butter mixture. This will cause it to froth up, as soon as this happens, stir into the dry ingredients. Grease a tray then add balls of the mixture, and press down to flatten. Note they will continue to spread during cooking so leave a generous amount of space between them. Cook in a preheated camp oven or wood fired stove for about 10 minutes, or until brown all over. When you take them out they will still be very soft, let them sit on the cooking tray for about 10 minutes to coll and firm up, then they can easily be removed. 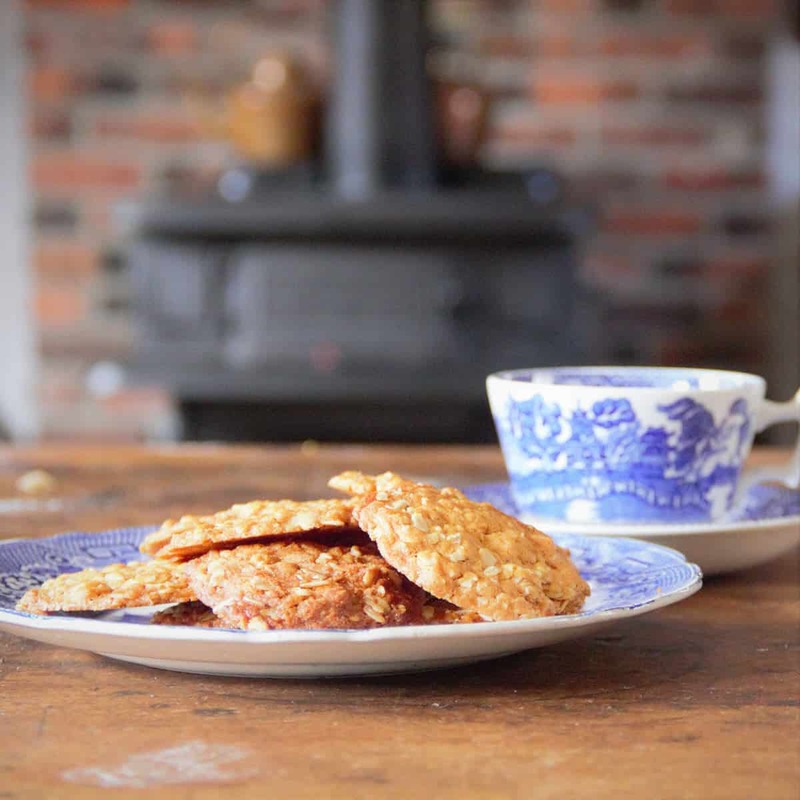 The traditional biscuits where thin, crisp and dry, ideal for long storage. If you like them soft and chewy, cook for less time so they remain moister and chewier. The best Chocolate Chip Cookies that you will ever have. These cookies are fun and easy to make. They are fantastic for parties, picnics and you’re friends. 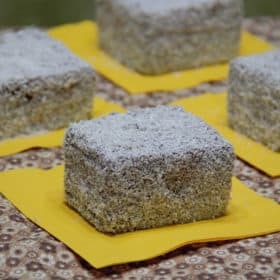 Perfect for picnics or day hikes, Lamingtons are one of my all time favorite cakes. 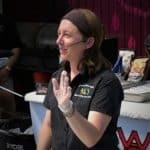 Probably one of the top 10 iconic Australian foods they are worth a try.